Cystic Fibrosis (CF) is one of the most common life-threatening inherited diseases. It is caused by a defective gene that controls the movement of salt and water in and out of the cells within the body. Cystic Fibrosis affects the internal organs, especially the lungs and digestive system, by blocking them with thick sticky mucus. This makes it hard to breathe and digest food. Cystic fibrosis (CF) is a genetic disorder that particularly affects the lungs and digestive system and makes kids who have it more susceptible to recurring lung infections. Due to high-tech medical advances in drug therapy and genetics, children born with CF can live longer and more comfortable lives. In the last 10 years, research into all aspects of Cystic Fibrosis has helped doctors to understand the illness better and to develop new therapies. Ongoing research may lead to a cure in near future. The inherited CF gene directs the body’s epithelial cells to produce a defective form of a protein called CFTR (or cystic fibrosis transmembrane conductance regulator) found in cells that form the lining of the lungs, digestive tract, sweat glands, and genitourinary system. When the CFTR protein is defective, epithelial cells can’t regulate the way chloride to pass across cell membranes. This disrupts the essential balance of salt and water needed to maintain a normal thin coating of fluid and mucus inside the lungs, pancreas, and passageways in other organs. The mucus becomes thick, sticky, and hard to move. Normally, mucus in the lungs traps germs, which are then cleared out of the lungs. But in CF, the thick, sticky mucus and the germs it has trapped remain in the lungs, which become infected. In the pancreas, thick mucus blocks the pathways that would normally carry important enzymes to the intestines to digest foods. When this happens, the body can’t process or absorb nutrients properly, especially fats. Kids with CF have problems gaining weight, even with a normal diet and a good appetite. For a baby to be born with Cystic Fibrosis, both parents must be carriers of the defective CF gene. 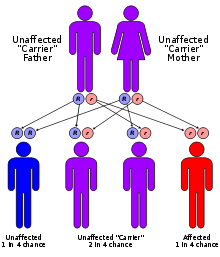 The diagram shows how CF is inherited. Where both parents carry the faulty gene, each child has a one in four chance of having CF, a two in four chance of being a carrier and a one in four chance of not having any CF genes. Cystic Fibrosis affects more than 30,000 kids and young adults in the United States. Each week, five babies are born with Cystic Fibrosis. Presently half of the CF population will live past 41 years of age, and improvements in treatments mean a baby born today is expected to live even longer. If you are interested in home care advice, consider www.carehomestoday.co.uk for expert advice on nursing homes. This entry was posted in Inherited Diseases and tagged cystic fibrosis, cystic fibrosis carrier, cystic fibrosis causes, cystic fibrosis chromosome, cystic fibrosis facts, cystic fibrosis gene, cystic fibrosis genes, cystic fibrosis genetics, cystic fibrosis life expectency, cystic fibrosis picture, cystic fibrosis statistics, cystic fibrosis stats, cystic fibrosis tests, genetic disorders, what causes cystic fibrosis, what cystic fibrosis, what is cystic fibrosis on February 26, 2013 by Dr.Sobia Adnan. Cystic Fibrosis is increasingly being diagnosed through screening, but some babies and older children (and even adults) are diagnosed following unexplained illness. There are three types of screening for Cystic Fibrosis: newborn screening, carrier testing and antenatal testing. The test is a heel-prick to sample blood as part of the normal Guthrie test carried out on all children. The sooner cystic fibrosis is diagnosed, the sooner appropriate treatment can begin. This entry was posted in Inherited Diseases and tagged cystic fibrosis, cystic fibrosis awareness, cystic fibrosis carrier, cystic fibrosis causes, cystic fibrosis chromosome, cystic fibrosis facts, cystic fibrosis gene, cystic fibrosis genes, cystic fibrosis genetics, cystic fibrosis life expectency, cystic fibrosis picture, cystic fibrosis pictures, cystic fibrosis recessive, cystic fibrosis statistics, cystic fibrosis stats, cystic fibrosis test, cystic fibrosis testing, cystic fibrosis tests, genetic disorders, how to diagnose cystic fibrosis, living with cystic fibrosis, what causes cystic fibrosis, what cystic fibrosis, what is cystic fibrosis on May 19, 2012 by Dr.Sobia Adnan. Cystic Fibrosis causes the body to produce thick secretions that particularly affect the lungs and digestive tract. Symptoms include a persistent cough, repeated chest infections, prolonged diarrhea and poor weight gain. These symptoms are not unique to Cystic Fibrosis. Cystic Fibrosis affects the pancreas, which makes it difficult for people with CF to digest food. This can cause malnutrition, which can lead to poor growth and delayed puberty. In older patients, insulin production can become deficient due to increasing pancreatic tissue damage. Some develop CF related diabetes mellitus and their blood sugar levels are no longer controlled. This rarely happens to children with Cystic Fibrosis. Common symptoms of diabetes include thirst, hunger, weight loss and excessive need to urinate. People with CF develop thin, brittle bone due to the nutritional and other problems involved with the disease. Bone disease in adults is because of the adverse effects of steroids taken to control lung disease. In most men with CF, the tubes that carry sperm are blocked, which causes infertility. Because underweight women are more likely to have irregular menstrual cycles, the nutritional problems associated with CF may affect fertility. Women with CF do produce healthy, fertile eggs so effective contraception is necessary. Cystic Fibrosis does not cause sexual impotency. This entry was posted in Inherited Diseases and tagged cystic fibrosis, cystic fibrosis carrier, cystic fibrosis causes, cystic fibrosis chromosome, cystic fibrosis facts, cystic fibrosis gene, cystic fibrosis genes, cystic fibrosis genetics, cystic fibrosis in children, cystic fibrosis life expectency, cystic fibrosis picture, cystic fibrosis statistics, cystic fibrosis stats, cystic fibrosis symptoms, cystic fibrosis tests, genetic disorders, meconium ileus in cystic fibrosis, what are the symtoms of cystic fibrosis, what causes cystic fibrosis, what cystic fibrosis, what is cystic fibrosis on May 19, 2012 by Dr.Sobia Adnan.